This locomotive was the penultimate to be produced by Ruston Hornsby – of their second generation designs. This was intended to update the 165 design by incorporating a more powerful 200h.p. turbocharged engine with a better arranged cab and viewing for the driver and crew. Few were sold before the decision to cease production of railway equipment was taken by the RH group. The locomotive was delivered to 23rd January 1969 to Hays Chemicals in Sandbach, Cheshire. Time was not kind to the loco as the salt laden environment and the practice of leaving the loco idling throughout the shift led to a worn out loco when preserved in 1996. A full structural rebuild has been completed on this loco and a brand new engine acquired which will be fitted in the next year or two – the intention being to bring the loco into operational use. 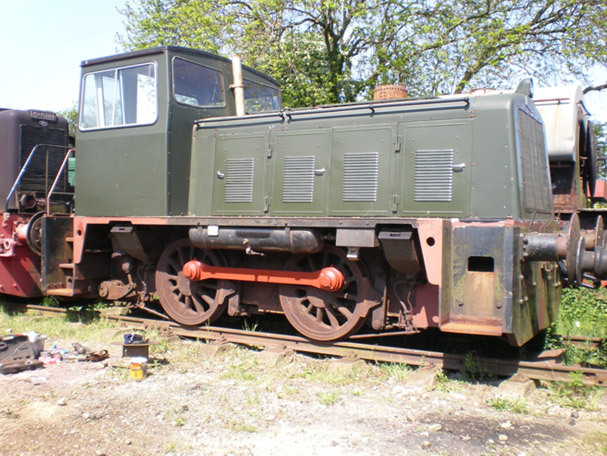 It is also intended to name this loco ERIC TONKS as a fitting testament to his work in documenting the history of the Ruston Hornsby production, his association with the east midlands ironstone quarry railways and of course his strong support of our endeavours.